Hartland Garden Apartments ... classic modernity. Construction work on the second phase of the $4-billion Sobha Hartland, a mega project located in Mohammed Bin Rashid Al Maktoum City in Dubai, will start shortly, according to the Sobha Group, its developer. “Ground-breaking on the first villas and apartments and infrastructure work will start in the second quarter and the handover of the first phase will begin by the first quarter of 2017,” says Ajay Rajendran, vice chairman, Sobha Group, Dubai. On the infrastructure front, bids have been received for roads and utilities packages, says the developer. 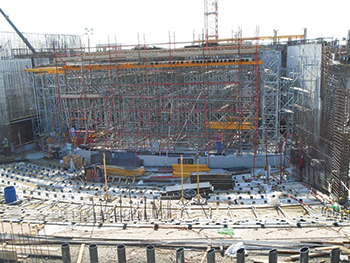 Work on the first phase comprising Hartland International School, the group’s first international curriculum school, is nearing completion and will be ready for the academic year starting in September. With a built-up area of 30,807 sq m, the ground-plus-two-storey school is located 3 km from the Burj Khalifa. In terms of design, the school will feature classrooms each spread across 63 sq m of space, facilities for science, technology and robotics and a large auditorium with projection, stage and concert facilities. It will also offer an eight-lane, 25-m swimming pool and a training pool for beginners, an indoor sports centre for gymnastics, basketball, badminton and football and an outdoor football field. The rooftop will feature tennis and netball courts and shaded play areas with indoor activity rooms for dance, drama and physical development. 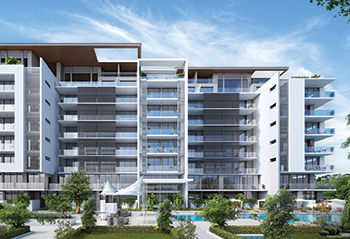 Sobha Hartland is an integrated premium mixed-use development being built over a land area of 8 million sq ft with more than 30 per cent of the area dedicated to open space and green landscaping. Centrally located in the heart of Dubai, the freehold property offers 282 luxury villas and apartments of various configurations. The project is one of the closest villa developments to Dubai International Financial Centre, according to Rajendran. As a part of community living, the project will comprise two international schools, hotels and spas, retail areas and commercial office space. Describing the villas and apartments, he says: “Hartland Villas are freehold villas with a unique L-shaped ultra-contemporary design, providing a perfect blend of privacy, space and comfort and verdant atmosphere. There are plenty of offerings in term of design and build to suit everyone’s needs, from four, five and six bedrooms to ‘Signature Residences’ and 12 different floor-plan options. All 282 villas will be minimalistic in design and will be built in line with our philosophy of ‘no shortcuts to quality’,” says Rajendran. The size of the villas will range from 6,259 sq ft to 17,000 sq ft featuring contemporary designs with panoramic windows, offering breath-taking views of the development. Along with a driver and a maid’s room – and even a cinema and gymnasium in the six-bedroom villas – each villa will have two to four dedicated parking spaces. The L-shaped design of the villas transforms the backyard into a courtyard – offering the perfect blend of privacy, space and comfort, he adds. The eight-storey garden apartments will reflect classic modernity while maintaining a balance of style and functionality. There are extensive park areas located in between the buildings and numerous leisure offerings. Each building will include studios, one-, two- and three-bedroom apartments as well as two- and three-bedroom duplexes. Each building is designed to create a space for community living, recreation and entertainment which also fosters a sense of well-being. Architecturally, the buildings are minimalistic, contemporary, elegant and modern, merging with the design theme of the development as a whole and contributing positively to the streetscape, says Rajendran. The project offers abundant green space throughout the development with contemporary and expansive layouts that perfectly balance style and functionality, he adds. Hartland International School ... nearing completion. Sobha Group is currently also developing the $9-billion Mohammed Bin Rashid (MBR) Al Maktoum City, District One. “In 2013, we launched a joint venture project in equal partnership with the reputed Meydan Group to build Mohammed Bin Rashid Al Maktoum City – District One in the heart of Dubai. This one-of-a-kind residential development is being built in over 1,100 acres of land,” says Rajendran. The concept behind the project was to develop a mixed-use development in the heart of Dubai, he adds. 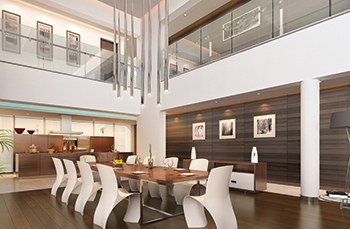 PNC Architects is the consultant and Sobha Engineering and Contracting is the main contractor. With nearly four decades of experience in creating interiors of palaces, high-end mansions and hotels in the Middle East, PNC Menon founded Sobha Developers in India in 1995 with a clear vision to transform the way people perceive quality in the real estate sector in India and the Middle East. Based in Dubai, Sobha Group is one of the fastest growing and fully backward-integrated real estate players in the region. Sobha and its related companies are involved in all aspects of Sobha Hartland development – masterplanning, architectural design, interior design, structural and MEP (mechanical, electoral and plumbing) design, execution and landscaping. This ensures complete control over timely delivery, cost and of course exceptional quality. Phase One: The development of its first business in Oman from a small interior decoration firm into a profitable and highly reputed contractor with large and prestigious projects in the Middle East for important clients including ruling families. Phase Two: The establishment of Sobha India to deliver high-quality residential real estate developments in a market that had not been previously exposed to this level of quality. The organisation today claims to be India’s third largest real estate development company in terms of total sq ft delivered in the country, and has attained a reputation as the most reliable and admired brand for real estate development. Phase Three: The creation of Dubai-based businesses, initially through Sobha Engineering and Contracting, and currently through two landmark projects, Sobha Hartland and Mohammed Bin Rashid Al Maktoum City – District One, totalling a built-up area of 26 million sq ft with a combined top line of $13 billion. Phase Four: This phase of Menon’s entrepreneurial journey marks his most ambitions one to date. Menon Capital was formed in 2014 as the holding company to drive the next era of growth in real estate globally. It will also mark the creation of new verticals such as hospitality, furniture, interiors, building automation and lighting, to name a few. Commenting on the construction sector in Dubai, Rajendran says: “With new regulations put in place by Rera (Real Estate Regulatory Agency) and the UAE Central Bank, Dubai’s real estate market is fast maturing. A less volatile market bodes well for all – end users and investors alike – and hence makes Dubai a more appealing market globally. “In the last quarter of 2014, the market witnessed subdued price growth and the forecast for 2015 is expected to be a continuation of the same. The market is becoming more sustainable and stable,” he concludes.